Recording Details apply to a specific test environment or participant set up. Recording Details do not have to be the same for all recordings in a study. The fields in the Recording File Details settings of the Recording Details dialog box define the recording name, folder, and description, along with the file processing options. Put information in these fields to name the recording file, define the folder to save the recording, and describe details about the recording (optional). Enable the applicable processing options. Enable the Prompt for file details when recording stops checkbox if you do not want to define the file name, folder, and description prior to recording. Recorder will prompt you to Define File Details after Recording at the end of recording. Enable the Password protect recording file checkbox to “lock” the recording files if your recordings include sensitive material. Make sure to remember your password. After you assign a password, you cannot open the recording in Manager without the password. TechSmith cannot retrieve your password or open the recording file if you forget your password. By default, Recorder writes out and verifies each recording (.rdg) file immediately after a recording is completed. Depending on the length and content of the recording, this processing can take some time. Enable the Defer processing of recordings checkbox to defer recording processing, which allows you to start another recording immediately. Recordings are saved in the Batch Processing Queue, and you can later process several recordings at one time. In Capture Options, define the main video source, Picture-in-Picture option, mouse video effects, and the data to capture during recording. The fields in the Capture Options of the Recording Details dialog box define the data you want Recorder to include in the recording. Use this data later in Manager for analysis and graphs. Define if you are recording the computer screen or camera video as the main video source for your recording and if you want to include a Picture-in-Picture (PiP) video. These options are also available on the main interface in Video and Audio Sources. If you change the main video source or PiP options in the Recording Details dialog box, options selected in Video and Audio Sources update automatically. Define which, if any, mouse video effects to include in the recordings. 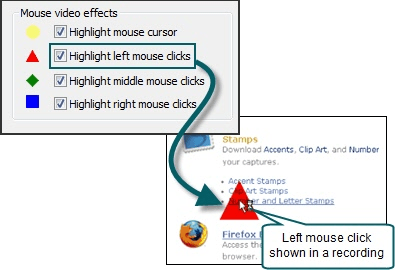 Mouse video effects help emphasize mouse clicks when analyzing recordings in Manager. The mouse video effects do not appear on the participant’s screen or in the Observer during recording. The effects appear when you import the recording in Manager. By default, Recorder captures all of this data. If you are dealing with sensitive or proprietary information, you may need to exclude some data from capture. For example, if the test deals with user names and passwords, you can choose to exclude keystrokes. By excluding keystrokes, the recording will not capture the password. The checkboxes in the AutoPilot Settings of the Recording Details dialog box define if and how you want to use AutoPilot. Enable this checkbox to turn on AutoPilot. When you choose to use AutoPilot, the Task Logger, Recording Start, and Recording Stop change to AutoPilot to provide the recommended configuration. If you use AutoPilot to run an unmoderated test, someone may not finish a session. Enable the checkbox and enter the amount of time you want AutoPilot to wait until ending the session. The task logger is the one observer can log tasks for each recording. Only the task logger can mark the start and end of tasks. When defining the task logger, choose one of the following options. Use this option if you only have one Observer or everyone connecting to the session could log tasks. If the task logger disconnects Observer from the session, intentionally or not, the next Observer who connects automatically becomes the task logger. Use this option if you know exactly who you want to log the tasks. If the designated task logger disconnects Observer from the session, whether intentionally or not, no one else can log tasks. If the task logger reconnects, he or she can again log tasks. Use this option with AutoPilot. As the participant clicks Start Task and End Task in AutoPilot, it logs the corresponding markers in the recording. Use this option if you record camera as the Main video source. This setting allows you to log on the same computer you record on. Recording starts or stops when you click the Start button or use the hotkey combination <CTRL+ALT+SHIFT+F9>. Recording starts or stops when a certain event occurs. Choose an event type from the dropdown menu. Recording starts at a particular date and time. Leave the box next to the Date field unchecked if you want the recording to start at that time on any date. Recorder must be running at the time the recording is set to begin. Recording stops after number of hours entered. Recording starts or stops when an Observer clicks the button on Observer’s toolbar. Click the Start button to launch the AutoPilot interface. Recording starts when the participant clicks Start after reading the study instructions in AutoPilot. Recording stops when the participant completes or ends the session. With Morae, you can allow one or multiple computers to connect over a network to a computer running Recorder. 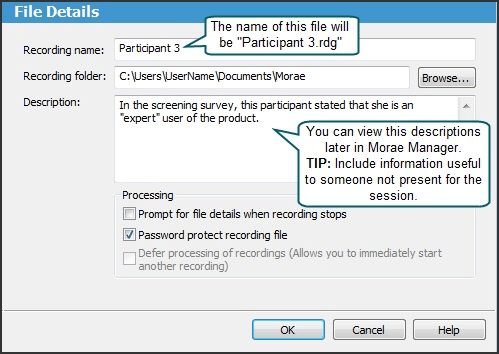 All observers can view the recording and log markers during a session. This flexibility allows your entire team to observe the screen and camera video and hear the audio of the user, streaming from the Recorder computer. Enable the Allow Observer checkbox. Enter the amount of time Recorder waits for pending (unfinished) tasks and markers before ending the recording. By default, Recorder waits 60 seconds.